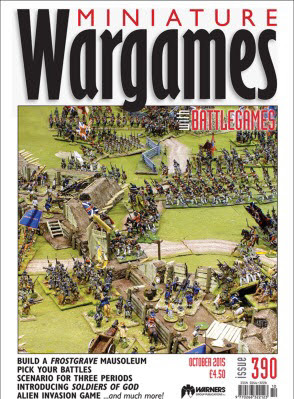 On Friday 25th September 2015, Miniature Wargames magazine will appear on the shelves of high street newsagents and I am mentioning that here because this particular issue contains a submission of mine. 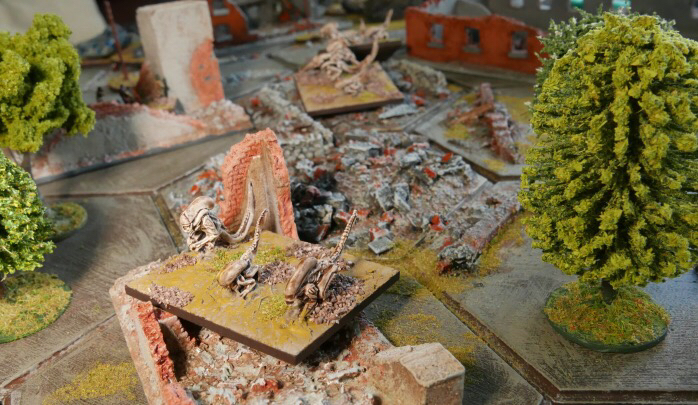 Called containment, the general storyboard is that there has been an alien incursion in the UK and a specialst unit has been deployed to 'contain' these rather viscious warriors. The article gives some background information, three linked scenarios and a set of rules. The games were played out on Kallistra hexed terrain using a town setting with Pendraken's 10mm sci-fi forces (plus a home-made 'seeder' or two). The whole action is contained within a hex grid measuring 8 wide by 6 deep, fitting onto a large pinboard. Gamers can easily convert to squares or just use an open board. There is an earlier post here (see link in the Resource secion below) that covers the putting together of the of the Pendraken sci-fi forces. I obviously can't repeat the rules here, or use the photographs submitted to the magazine, but hopefully those interested will pick up a copy. The below link gives an idea what is in this month's issue, I think there is plenty there to like. just browsing my issue, and your namesake (Steve J) has another of his brilliant articles of doing a scenario for a given period and then adjusting the same scenario for two other periods - and there is a nice Charlie M Grant article on how to create linked battles without the hassle of a full blown campaign. Time for coffee, a comfy chair and half an hour out ..... hurrah. Sounds like an issue to definitely pick up Norm. Thanks Jay, I think the rules are quite heavily influenced by my Tigers at Minsk set, so perhaps some reversal to WWII would not take too much tinkering.